In my previous postings on the Name of the Creator and sovereign God of the universe, Yehovah, I talked about the importance of knowing and speaking His Name, as well as the sad history of the silencing of God’s Name for the past 2300 years (see There is Power in the Name). If you recall from that blog, after the return from exile in Babylon, priests of the Second Temple era decided that God’s name was too holy to pronounce, and they banned the speaking of the Name among the Jewish population in general and even within the Temple. In this blog, I wanted to present some encouraging words to believers who feel discouraged and helpless, knowing that the Name of Yehovah is known by so few of God’s people, and even a smaller number of people across the Globe. We know from Scripture that Yehovah wants His name to be known throughout the Earth, by Jews and non-Jews alike (see Ps 91:14, Isa 52:6, Jer 16:21, Eze 12:15; 22:16; 30:26; 36:23; 39:7; Amos 5:8, John 17:6). We also see clearly in Scripture that YHVH wants everyone to speak His name (Gen 12:8; 26:25, Isa 44:5; 54:5, Jer 10:25). While it is true that most people on earth (believers and non-believers alike) do not know what to call YHVH, we have heard recently about how Yehovah is starting to reveal His name to His people in diverse places. We have experienced this especially among non-Jews who are keeping the Biblical feasts and celebrating YHVH’s Sabbaths. I recently saw a very interesting example of the unveiling of YHVH’s name in a newsletter that comes out Israel on a daily basis. It is called Jerusalem365 and each article is a combination of a Scripture verse (in English, Hebrew, and transliterated Hebrew), and a photo and story of something happening in Jerusalem that relates to the verse (you can subscribe to the newsletter at the Israel365 site: Israel365 Subscribe). The photographers and authors of the articles are all Israeli Jews, many of whom have made aliyah to Israel (meaning they have emigrated there from other countries). Here’s the thing that fascinated me about some of their articles: whenever the verse contained YHVH’s Name (“The LORD” in English translations), the Hebrew lettering included the vowels and spelled out YHVH so that it would be pronounced as Yehovah. To be more accurate, YHVH was actually spelled out two different ways in various articles: sometimes it was spelled out exactly as Yehovah, and other times they used a common technique of obscuring the exact Name of God (they reversed the first and last letters). Because of the ban on speaking or writing the fully pronounceable Name of God, Jewish people would be required to spell God’s Name as HaShem (simply “The Name”), Adonai (Lord as a title for God), or one of the abbreviations used for YHVH in the Torah and other ancient Jewish writings. When the Hebrew was transliterated into English, it was written as Adonai, which would be acceptable to Rabbis and Orthodox Jews. The Name in the English text is written as “The LORD”, which is the standard translation found in most English Bibles. The key point here is that God’s true Name, which Jews refer to as the unpronounceable Name of God, is being revealed to individuals in Israel, and is now being communicated out to thousands of people around the world. 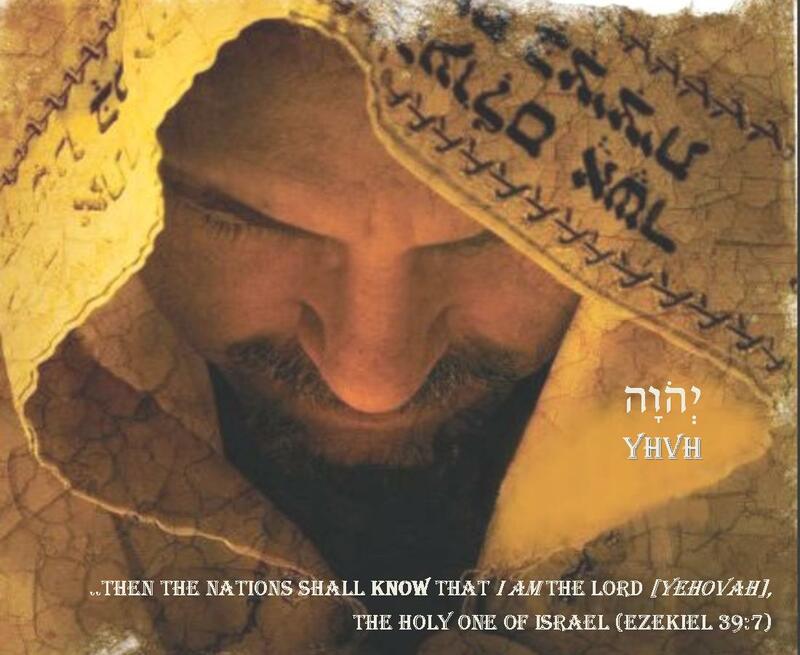 While it is true that most Christians and many non-Orthodox Jews would not be able to read the Hebrew or understand the significance if they could read it, YHVH is nevertheless revealing His Name to Israel and the Nations as He said He would (Eze 39:7). In the greatest prayer that Yeshua prayed, He first said that He had glorified the Father by finishing the work that Abba had given Him to do. (John 17:4) And what work had He completed? In Verse 6, Yeshua says that He made YHVH’s Name known to the disciples that Abba gave Him “out of the world”. From this verse we can see that one of Yeshua’s primary missions was to make known the person, character and true Name of YHVH, so that He could glorify God the Father on earth. [Remember that even in Yeshua’s time there was a ban on speaking the Name of God]. Verse 5 says that after Yeshua’s work was done on Earth, then Abba would glorify His Son by bringing Him back to heaven to be with Him again. So what does all this mean to us as followers of the Way? If Yeshua made Abba Father known to us by revealing His true Name, then I do not want to waste Yeshua’s hard-earned fruit produced while He was here on the Earth. I hope you will also want to know YHVH’s true Name and that you will want to speak it in your praise and prayers to Abba – Yehovah wants His name to be known, spoken, praised, feared, and glorified throughout the Earth! Previous PostA House UnitedNext PostHow About You?